Magnolia is only 5 stories. Not many people would call that a "tower." TCC is only a proposal. The Magnolia station project is an addition to the already present historic Magnolia lofts in VP. They're are situated across the Parking Garage for the AAC where Katy trail ends. There's more you forgot the brewery building..I believe preliminary work has started on the renovation part. Also don't forget M-line tower,case building, the Oliver. Also the city place building will have some apartments with the hotel. Not sure about the Drever but that's another one too. Indeed there are other residential projects under construction in central Dallas, including quite a number of additional highrises. But the topic posited by Willyk was residential towers in VP/KWP/Harwood. -- The brewery is not a tower and it is not in the specified area. Last edited by Tucy on 15 Mar 2017 18:13, edited 1 time in total. ^^ With Uptown filling out, I can see vertical density take a huge spark in the Knox-Henderson area, as well as Deep Ellum. I'm hopeful that we will see tall, hopefully a supertall or two, rise in the CBD, and hopefully tall vertical projects in the Cedars, which is just ripe for density development, and without the height restrictions of Uptown! joshua.dodd wrote: ^^ With Uptown filling out, I can see vertical density take a huge spark in the Knox-Henderson area, as well as Deep Ellum. 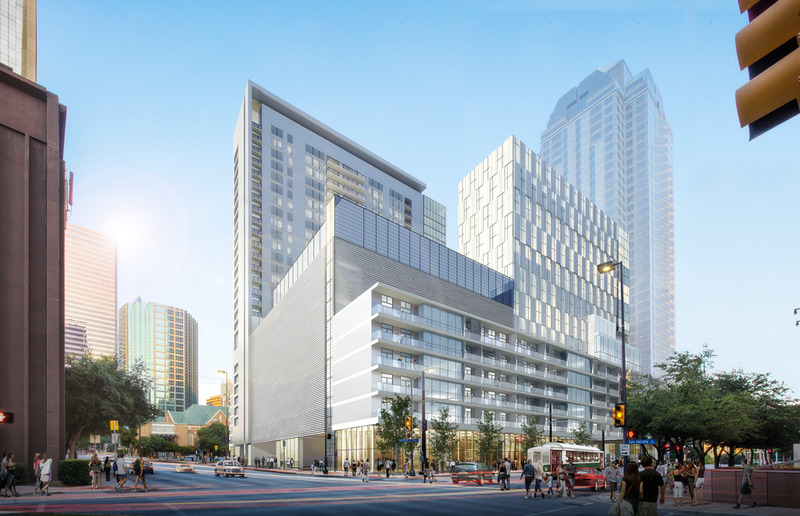 I'm hopeful that we will see tall, hopefully a supertall or two, rise in the CBD, and hopefully tall vertical projects in the Cedars, which is just ripe for density development, and without the height restrictions of Uptown! just curious, what is the uptown height restriction at currently? -- The brewery is not a tower. I believe the brewery re-development will include a 15 story residential tower. So it does. But the tower is not under construction, is it? No not yet. But construction should be starting soon. What I am puzzling over is why was the TCC residential tower relegated to phase two? The competitive towers under construction seem set to deliver in two waves. Soon we will get Sky 2, Ascent, Katy and Blue Ciel. Later will come Cinepolis, Union and Park District. That's a lot of product, and I don't think Dallas has ever had that much hit the market at once. And posters have correctly pointed out that there are others not too far from these seven. I can see where lenders would be cautious. Do we need to see some uptake from these towers before TCC, Flora and AMLI will start? I meant to bring up before about the Olive St. side of the new-construction (garage/hotel/possible res.) part of this whole gig. From this *video*, the Olive St. side appears to get the blank wall/utility/service treatment. Understandably, Ross Ave. gets a lot of love and with the positioning of the hotel, Harwood St. gets some activity. I can't tell what the last side has in store, but, maybe another service entry? Anyway, the Olive St. treatment checks with chart for so much of the street. Starting at Elm and let's just head up to and end at Cedar Springs, you have nothing but parking lots, garage entrances, loading docks or drives, blank walls, narrow sidewalks with sometimes crumbling infrastructure and street furniture along it, a highway exit with no yield or stop w/faded diagonal pedestrian crossing, etc. for almost the entirety of this stretch. Sheraton is a mild, brief exception around a couple of entrances across from each other. The tracks/Cancer Survivors Plaza zone has some decent pedestrian activity who are passing through to other places nearby. 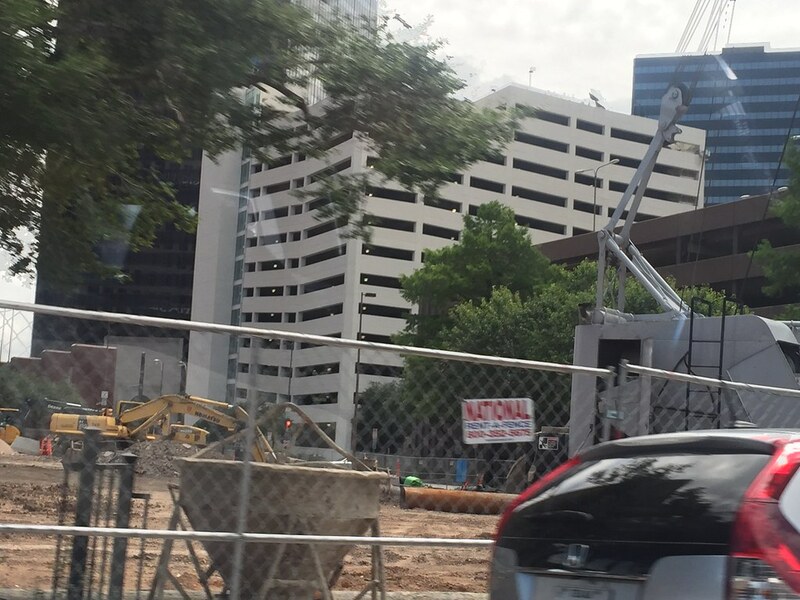 Klyde Warren Park is an obvious exception, although Olive St. being open through it is another story. McKinney & Olive Tower and intersection is an exception, or will be more of one maybe, when the M&O Tower retail fills in (which they are still not in a hurry to do). The Ritz doesn't appear to be in any hurry to ever open up their fortress wall. The Cedar Springs intersection is bizarro, yet, gets rather good business-hours pedestrian activity at some points throughout the day. The M-Line runs along so much of this uninteresting stretch of road, too. . . sometimes blocked by the rolling trash can at the Nasher sitting on the tracks, truck drivers not familiar with the service roads around an active and ambient PARK atmosphere between the service roads and blocking the box (and therefore tracks) as they travel on the North side, delivery vehicles parked on the tracks at 2000 McK., and a traffic signal that breaks often at the M & O intersection. Just preaching to the choir. OK, all the obvious was stated. The plus side is, it still slices through some good stuff, too, fronting the perpendicular streets. Not hard to just walk around the corner and find some good things to do. So there's that. A bulldozer is now on site. Last edited by Redblock on 22 Mar 2017 19:39, edited 1 time in total. Bye bye ugly Bradford Pears! Lots of good stuff on the north side of downtown. 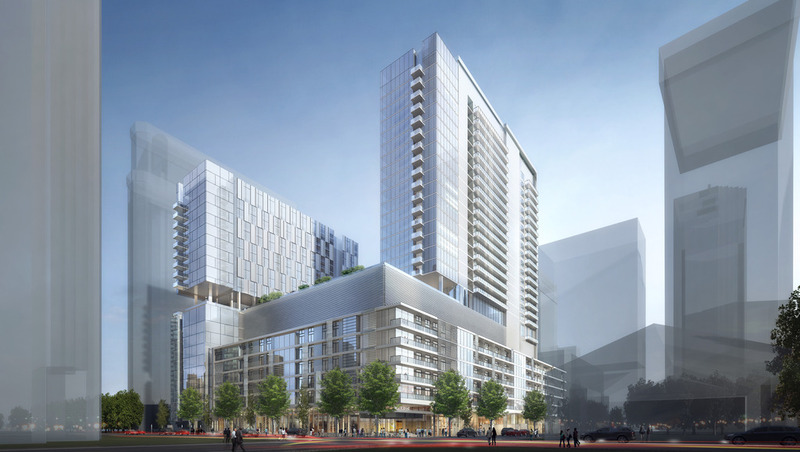 So if this project is supposed to be a companion of sorts to Trammell Crow Tower, where's the 'connection'? If there is no elevated walkway or tunnel connecting the 2, and 2000 Ross is supposed to be TCC's extra overflow parking as well as for 2000 Ross's own tenants/amenities, is everyone working in or visiting TCC supposed to play Frogger back and forth across Ross (which, the last time I checked, is still a busy street)? I've never heard from any source why the 2 sites are companions when we could very easily talk about 2000 Ross in its own conversation without even mentioning TCC. I'm not bashing the project...I'm glad we're getting rid of another desolate surface parking lot. jrd1964 wrote: So if this project is supposed to be a companion of sorts to Trammell Crow Tower, where's the 'connection'? If there is no elevated walkway or tunnel connecting the 2, and 2000 Ross is supposed to be TCC's extra overflow parking as well as for 2000 Ross's own tenants/amenities, is everyone working in or visiting TCC supposed to play Frogger back and forth across Ross (which, the last time I checked, is still a busy street)? I've never heard from any source why the 2 sites are companions when we could very easily talk about 2000 Ross in its own conversation without even mentioning TCC. Thank goodness there's not a tunnel or a bridge! Crossing Ross Avenue is really no big deal. I do it twice a day, every day, and never feel unsafe. The executives will remain parked in the main garage. The lower level employees will be across the street and the executives up top don't really worry about whether those people have to cross the street once in the morning and evening. Also, I have not heard where they absolutely are not having a tunnel. They never discuss it in the articles. It could still be in the plans. Could be waiting for the final study on the possible costs of either solution underground or above ground to push for those city approvals. In the meantime no reason to stop all work just to wait on a sky bridge or underground tunnel final approval from the city. Many companies sign leases with caveats for things like this when the property owner has confidence they can get approval. The rate may be a little less without a direct access. Then it's up to the property owners to get the project done to get a better price. The more I read about the 2000 Ross, the more it sounds like just a parking garage. ...no telling what will happen with the residential portion of this one. The hotel, restaurants and parking is to support the skyscraper, nothing else. Maybe a few years pause on the residential component will turn into a larger residential component. A redevelopment wave is marching up Ross Avenue. An army of construction workers is descending on the downtown street to transform the longtime office address into a booming boulevard of shops, restaurants, hotel rooms and residences. For decades one of Dallas' busiest thoroughfares, Ross Avenue won't just be about cars and office towers in a couple of years. Projects on the way are designed to make the street on the north side of downtown into more of a walkable retail destination. "In many ways, it's the new Main Street of Dallas," Hall said. "There are a lot of improvements that are going to be made in the next five to 10 years." This article is just about general development on Ross, but it also mentions 2000 Ross. A few years ago, I honestly would have thought that, once Uptown started to fill out, we'd see development spillover to Oak Lawn. Pleasantly surprised to see it has gone the other way and spilled over more into Downtown. I have always wanted to see Ross come to life, finally happening but hope this turns into more development on the ends. One, where Headington has his stake in the ground and the other near 345 (Spire). Tnexster wrote: I have always wanted to see Ross come to life, finally happening but hope this turns into more development on the ends. One, where Headington has his stake in the ground and the other near 345 (Spire). Ross definitely has potential. With the improvements being made on the downtown side and on the other side of the freeway. We may have something here... Imagine if Ross became walkable all the way up to Lower Greenville! What great potential!! Hopefully the Spire site is sold. Those Developers who own the site don't seem to have any plans to get something done here. It's been a long time since I've heard anything about that project. Spire is likely waiting until they've got the only land left.... Hopefully they will have a much better masterplan when the time comes. I take some encouragement from Civitas and Baker Botts choosing the Arts District. Hopefully this signals that all of the investment coming to Ross Ave already puts it on the verge of being a competitive alternative McKinney Ave. But even with the residential and hotel components coming at AMLI, Flora Street, TCC and Hall, I still don't see Ross Avenue as being as lively as McKinney Ave. The office buildings are scaled too large to ever feel personable. So I see it as a prestige address like Turtle Creek or Park Ave.
the original design was much nicer in my opinion, what do you guys think? 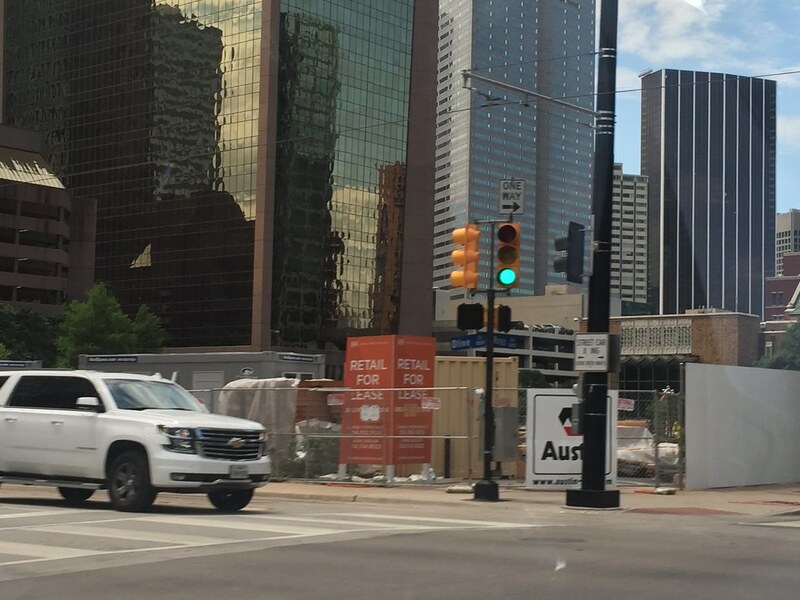 The lion statues were removed from the Ross Avenue side of Trammell Crow Center today. And I am not 'lyin' even if it is April Fool's. Digging away and it already looks like they've hit the foundations of some of the old structures that used to line Ross and Harwood. It really is too bad they aren't putting any part of this development underground. As soon as those foundational columns go in they will be going vertical instantly. I really really wish they would go ahead and build the apartment tower now. R1070 wrote: I really really wish they would go ahead and build the apartment tower now. Any ideas when they plan on bringing that forward? Or is this another switch a roo? They said a future phase or something. Last I read most of the banks lending to all these residential multi-family projects were ready to stop for a breather. While they agree the market doesn't look like a bubble and that the demand is absorbing the supply nicely they want to let some stuff open and fill up before funding new projects. Whether that's what actually is happening I know not. It's just as possible that as this project builds that the apartment tower could be announced to start sooner rather than later. ^Then they need to find the other banks, otherwise it looks like they're just trying to run-up purchaser price. It's pretty clear demand is greater than delivery. Virtually all 'bubbles' are artificially created when one segment of the process is left unattended. Maybe it just Dallas/Fort Worth and the shock by regional decision makers at the market rarely seen in which container is not (cannot) expanded a little ahead of the growing contents. The true timeline of this cycle is measured in decades, not biennial budgets. The pensive, anxious tracking today of a Victory Park flood of expensive apartments will turn into an exercise of justifiable extreme caution. 2000 Ross ought to have the residential component sooner rather than later. tamtagon wrote: ^Then they need to find the other banks, otherwise it looks like they're just trying to run-up purchaser price. It's pretty clear demand is greater than delivery. Virtually all 'bubbles' are artificially created when one segment of the process is left unattended. According to CBRE, in the first quarter of this year, the market absorbed 55% of the units delivered -- 3,934/7,163. "With the arrival of these deliveries, occupancy has slumped under 95.0% for the first time since Q1 2015. Properties in lease-up continue to offer concessions including one-month of free rent." Starting with the first quarter of 2012, absorptions have exceeded deliveries in only two out of 21 quarters. And another 27,689 units are under construction. No cause for overbuild panic, but some caution is understandable. Mind you what I read was one article in the Dallas Morning News so I doubt the banks are colluding that tightly lol. tamtagon wrote: The true timeline of this cycle is measured in decades, not biennial budgets. 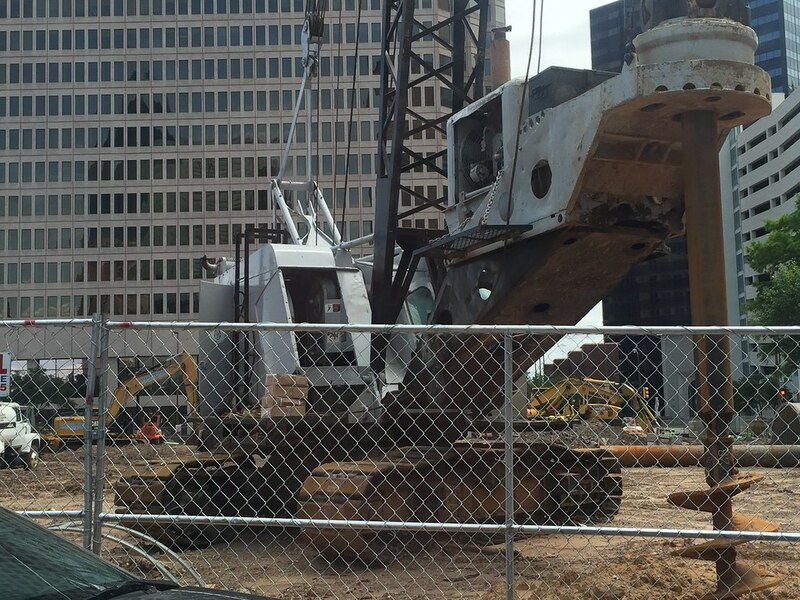 When North Texas population and employment growth slow down, then construction should too. Look across 7-10 years to smooth out the highs and the lows. Tucy wrote: According to CBRE, in the first quarter of this year, the market absorbed 55% of the units delivered -- 3,934/7,163. "With the arrival of these deliveries, occupancy has slumped under 95.0% for the first time since Q1 2015. Properties in lease-up continue to offer concessions including one-month of free rent." Starting with the first quarter of 2012, absorptions have exceeded deliveries in only two out of 21 quarters. And another 27,689 units are under construction. I'm a little surprised they aren't going forward with the residential tower. Maybe they will change their minds before too long. Downtown seems ripe for more residential options. Wow! It will be interesting to see how CBRE's 2nd quarter numbers compare.